Inside the .inf file are the geographical coordinates of the upper left and lower right corners and a title for the image map. 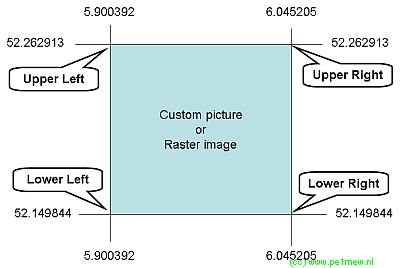 The location of the file is not mandatory as long as it is in the same folder with the raster image file. Longitude1 Longitude in degrees.minutes.seconds(N/S) of the 1st point in the raster image. Latitude1 Latitude in degrees.minutes.seconds(W/E) of the 1st point in the raster image. Longitude2 Longitude in degrees.minutes.seconds(N/S) of the 2nd point in the raster image. Latitude2 Latitude in degrees.minutes.seconds(W/E) of the 2nd point in the raster image. Name the text "Radio Mobile"
file name the first 15 characters of the raster image filename.